The term ISO container is another word used to describe a shipping container and is a reference to its standard size and dimensions. If you are offered an ISO container for sale then this should mean that it conforms to the International Organisation for Standardization recommendations on dimensions, corner fittings, markings and ratings amongst others. Shipping containers have evolved a great deal over the years. Early concepts were adopted by canal barge companies in the U.K. Railroad companies in the U.S dabbled with wooden and steel designs and the U.S military had various versions going back as far as World War II. It was not until Malcolm Mclean and Keith Tantlinger got together in 1955 to design the first intermodal container that any sort of standardisation took place and the equipment we see today began to take shape. Now that we have the ISO standard containers they are truly intermodal, able to be swapped from ship to railcar or trailer on set positions. Handling equipment can also now be standardised with lifting points on the containers also in set positions. 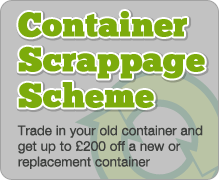 When looking for containers for sale there are lots of different terms used to describe what is being offered. If you are looking to ship your box though it would be advisable to ensure it is an ISO container as many conversions, cut downs or site cabins will not conform. In addition you will need to make sure the container has a valid CSC plate or ACEP sticker.